Pretty shortly after launching SeniorPooch.com I was amazed at the traffic that I was coming in from around the globe. I connected with one of those folks, Victoria Clare from the Oldies Club, on Twitter. From their mission statement: "The Oldies Club helps older dogs find forever homes." Since our missions are so common, and Oldies Club has been around for so much longer, I wanted to learn all about how they got started, what they're doing today, and what makes them tick. In the process, I also learned something about how adoptions work and that the things that motivate us to do right by our old canine companions is the same, regardless of which part of the globe that we live. SP: First, can you tell me a little about the Oldies Club, its mission, and how it got started? How long has it been around? 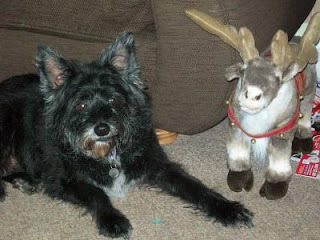 VC: Oldies Club was founded back in 2005 by regular visitors to an internet forum who wanted to help an 13 year old dog called Ted who had been found straying and was was terrified in the noisy, stark pound kennels. Publicity for his plight led to several home offers for him - many from people who would not have considered adopting a younger dog. After that, a group of volunteers decided that they would work together to promote other old dogs across Britain who might otherwise be overlooked. It became clear that there were far more old dogs in need of urgent help than rescues able to give them appropriate care so we started taking some of them into foster homes of our own, and fundraising to support their medical needs. We became a registered charity in 2007. We now work with over 100 other dog rescues across the UK to promote their old dogs. Every dog has a special writeup on their own page, created by our volunteers. Often busy rescue volunteers don't have time to think of all the questions an adopter might want to ask, so we try to make sure that all the information you might need about a dog is written up clearly and in a way that makes them sound appealing! We also operate as a rescue exclusively for dogs aged 7 and over. Although we do occasionally use kennels briefly when a dog has just come in, we try to get dogs into one of our volunteer foster homes as quickly as possible. We feel that kennels are not the best environment for elderly dogs that may have specific medical needs and are used to a home environment. SP: How did you find out about it and made you want to help? What's your current role? VC: I was one of the original group of dog forum users who came together to help old dogs by making posters and promoting them online. I started by building the website, but I now also foster dogs, transport, homecheck, am a member of the charity committee and run the Oldies Club twitter account! It all got a bit out of hand... though I feel I got away lightly compared with our current chairman, who originally volunteered to design a few posters! but Aqua still loves her walks in the garden. SP: So, just how many dogs do you help each year? VC: In the last year, we have taken in 108 dogs. Of those 86 were rehomed, 17 became sponsor dogs, 5 were put to sleep due to ill health. We take in as many as we can find foster homes for - the limitation on our activity is partly financial (looking after 108 old dogs is expensive!) and partly limited by the number of foster homes we have available. We carefully match each dog to the foster home. As most of our fosterers have dogs of their own, or other animals, we are limited in how many dogs we can take in that need to be the only pet. The most common reason for dogs coming in is that the owner is seriously ill, has died, or is very elderly and unable to give the dog appropriate care, though we do also often take in dogs from situations where the owner is in severe financial trouble, or is unable to provide for the dog for various other reasons. Sadly there are some where the owner just doesn't seem to want the dog any more. We feel that although the last situation is very sad and wish it didn't happen, we can't turn those dogs away : an owner that just doesn't care will not give the dog appropriate care, and may have him put to sleep when he is perfectly healthy or even dump him on the street if they can't find someone else to take him. SP: You mentioned that getting elderly dogs adopted can be challenging. Can you talk about one or two challenges? If possible it would be great to hear a happy ending to at least one of these. VC: Old dogs are more likely to come in with minor ailments and medical conditions which may limit the potential homes available to them. For example, our Curly Blue has now been waiting for a home for over a year. He's a lovely natured dog, but he is quite large in size, being a rottweiler, and since he developed arthritis, he has tended to be a bit picky about other dogs. This is entirely understandable - he's an old gentleman and he doesn't want to be barged about by boisterous younger dogs, but it does make it harder to find a home for him! Sadly, his foster carer is unable to keep him long term, as her house has a lot of steep steps, and as Blue gets older, this just isn't the right environment for him long term. He needs someone with level access to the house who also wants a very big dog, which is a difficult combination to match. However, there can be happy endings for dogs with medical problems. Last year I fostered Bob, a 9 year old lurcher who came in from a pound, underweight, covered in fleas, with very poor eyesight and a serious problem with his elbows that made it difficult for him to walk. We actually thought he was about 13 when he arrived, and were surprised to find from his ID tattoo that he was only 9 years old. It took a while for Bob to be ready to adopt, and at one point he was so ill that I really didn't think he was going to make it. Happily after a month or so with a warm bed and the right pain relief he started feeling much better. He also had to learn to be house trained! I don't think Bob had ever lived in a house before, so it took him a while to learn that peeing must always be done outside, but he did get the hang of it after a bit of training and lots of rewards for doing it right. 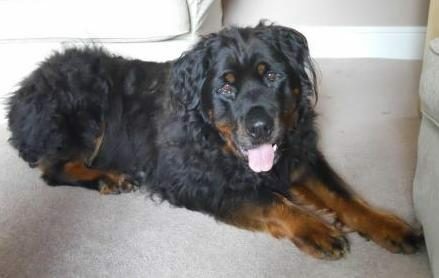 Bob is now in his forever home with an owner who absolutely adores him and he is still very much enjoying life. For many other happily ever after stories, see our Rehoming Stories category. 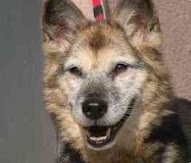 SP: In addition to educating people on how great older dogs are and showing some great adoptees off on your website (I'm partial to "Charlie", she has a great smile, and I bet a great attitude.) what other programs do you have in place now or plan to have in the coming year? Benefits? Adoption events? VC: We usually try to get our volunteers to hold stalls at a whole range of doggy events and fairs around the UK, but I don't think we have anything firmly booked yet. Because we are an online rescue made up of volunteers scattered all over the place we don't tend to run adoption events. SP:What else would you like people to know about adopting senior dogs? Dog can sometimes live up to 20 years. Even a large breed dog will often live to be 11 or 12. If you think there is a good chance you might not be able to look after a dog in 10 years time, please don't buy or adopt a puppy or a young dog. Older dogs can do most of the things that youngsters can : they will keep you company, get you out and about on walks, learn new things, give you a cuddle if you are feeling down. Some of them will even steal your slippers! They will give you all the love if you just give them a chance. SP: If someone local wanted to contact your organization to talk about adopting, what is the best way to do that? VC: Best way to contact us is via our website, where we currently list around 240 older dogs needing homes. Each dog record lists contact details for the relevant rescue at the bottom of the page. You can view all the dogs currently in Oldies Club foster homes as well as see a list of dogs sponsored by other rescue organizations that are shown on the Oldies Club website as well. SP: I see that you're looking for volunteers as well. What background/skills do your recommend for interested individuals? VC: No experience is needed to help with transport or fostering, though you will need some equipment - for example, a crate and a spare lead and collar for transporting, and dog bowls and a bed for fostering. For home visits we are looking for people who have a fair bit of experience with rescue dogs and may have fostered or transported for us or another rescue. 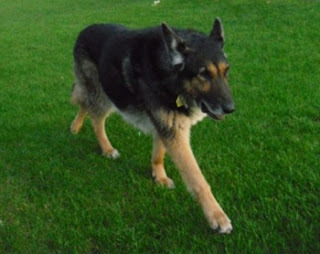 If you're in the UK and looking for a great senior dog, please check out Oldies Club. Like Victoria mentions, each dog has their own page, which allows prospective adopters to check out the personality of the dogs, including what they like (and don't), in addition to giving up to date information from their foster parents in many cases. Whether you're looking for a dog, or an animal advocate group looking to see how to be organized, you'd do well to check them out. All photos courtesy of the Oldies Club.